This is my 1/64 Kyosho McLaren F1 GTR, chassis #17R. And it’s meeting its 1/1 self for the first time! This F1 GTR is owned by BMW North America. It is currently on display down here in South Carolina at the BMW Car Club of America Foundation, along with a number of significant BMWs. Why is there a McLaren in the mix? Because of its BMW V12! 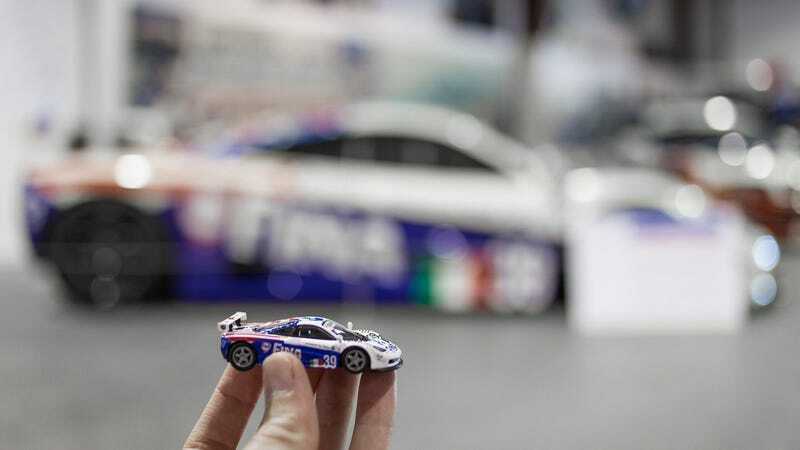 It’s nearly impossible to get a decent shot with halfway ok depth of field with a tiny car! I would have loved to be able to get it in closer, placing it in various spots on the car for some great pictures, but I of course couldn’t do that. This shelf is full of 1/18s. See my car? So tiny! Interestingly, McLaren didn’t intend to race the F1. Due to persistent requests for a racing version though, they ended up creating the GTR. I have many more photos of great cars that are at the Foundation, and they’ll be there through early January. It’s located right next to BMW’s Performance Center and just down the road from the factory and Zentrum. I’ll put up another post soon.